Why do no diamonds appear in frame chart? How do you make the diamonds show up in the frame chart? How can you fix the display panel? I love reader questions, and this article is based on a reader’s question. The best thing about articles based on readers’ questions is that I learn what terminology they use. Instead of “no diamonds appear in frame chart”, I would have said “Why are there no indicator things in the place with the bone names”! Another bonus is that the reader directly supplies a model which has the issue at hand. Without the reader, I would be stuck editing the default models to demonstrate my point. However, the model the reader gave me is this stunning model by Digitrevx. This is a very great model that deserves to be on MMD Models and Creators, but it has one weird flaw that I’ve noticed. The model has a really weirdly set up display frame that’s missing the vast majority of the bones. To begin, for a diamond to appear in the display pane, the bone you are manipulating needs to be in the display pane. This is the screen in PMX Editor which you will need to use. For a bone to be in the display pane, it needs to be added to a group. Luckily for me, I’ve already written an article explaining all of that here. However, if you understand all of that and just want a reference of what goes where, check here for a chart of all groups and what they contain. A small note is that when a bone name says “Null” in MMD, that is because there is no English name. 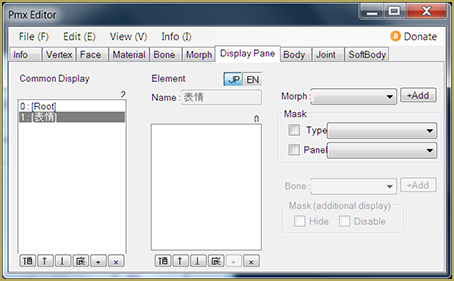 Going into the bone tab of PMX Editor and giving the bones an English name will fix that! Okay, but that’s not the issue sometimes. I had almost finished writing this article when I opened up MMD and looked at the display pane a little closer. One strange thing was that when I tried to register movement to a bone like “Null_44”, an “X” showed up. In this case, that means that you cannot move it as it is controlled by an IK bone. However, if you turn off physics calculation you are able to rotate the bone as normal. In addition, this issue is not about the diamond not showing up and instead about the diamond being an “X” that does nothing if physics calculations are on. Hopefully, you now know why no diamonds appear in frame chart! And in addition, hopefully you now know how to change the display pane in PMX Editor so that diamonds will appear.